Thanks to the ongoing and tireless work of our Rescue Team, animals from all around the world have been saved from a life of cruelty and neglect. All our animals have been rehomed to sanctuaries, where they will live out their lives in peace and happiness. After enduring years of hardship, these three lucky monkeys enjoy a new life together in safety and without fear. Rehomed in the idyllic Lakeview Sanctuary, they now have their very own brand new, and very large, permanent outdoor enclosure, with adjoining nighthouse. Tilin the baboon, rescued from a Bolivian circus, now has a companion in female baboon Tina. 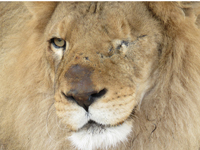 Tim was destined to be food for circus lions before ADI rescued him during Operation Lion Ark. Along with companion Rosita he is living his life out in safety. This doting couple once shared a small crate on the back of a truck with a travelling circus. After nine years of freedom in their very own piece of the African bush, Sarah and Caesar passed away within months of each other in 2016. Orlandito, released into the wild! Orlandito was snatched from the wild for the pet trade. Now, after years of determined work, ADI has released him to the Colombian forest with other capuchins. Toto the chimpanzee was reunited with his own kind, becoming a protective uncle to a family of young rescued chimps until he died peacefully in his sleep in July 2014. Following a dramatic rescue, ADI organised the rehoming of 20 animals from a circus in Mozambique.